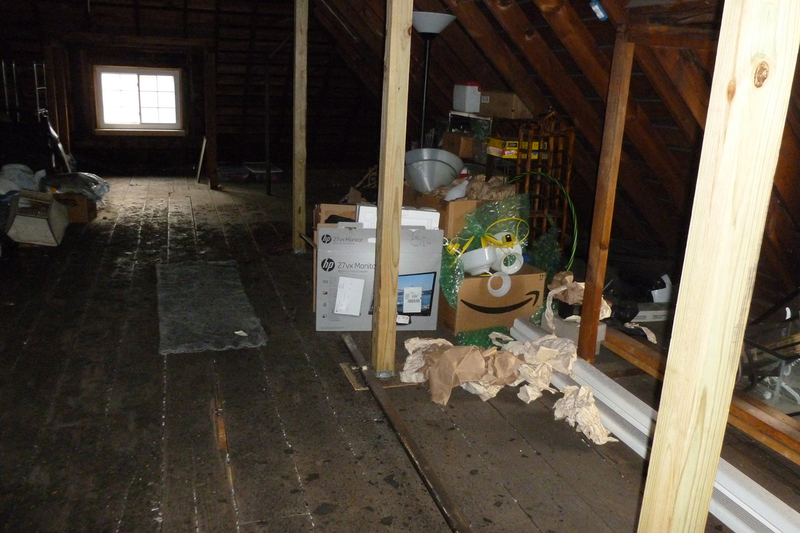 Our attic is (and has always been ) a nightmare. The roof seemed to be in decent enough shape when we bought the place, but just one year later the south-facing side was oozing water like crazy. There used to be a window set into a little dormer there; since that side bears the brunt of any weather we get here, it wasn’t long before the frame was falling apart and the roof was in serious danger of collapsing. In 2010 a friend of ours helped us brace the beams and we paid a roofer to seal up the worst sections of the roof (around the chimney, especially) and do some spot repairs – but of course a replacement was what we really needed. In late 2015, we finally pulled together the funds to replace the south side and the flat top of the roof. The roofer also pulled out the dormer and sealed up the old window space. The north, east, and west sections of the roof are still sound so we left those alone. 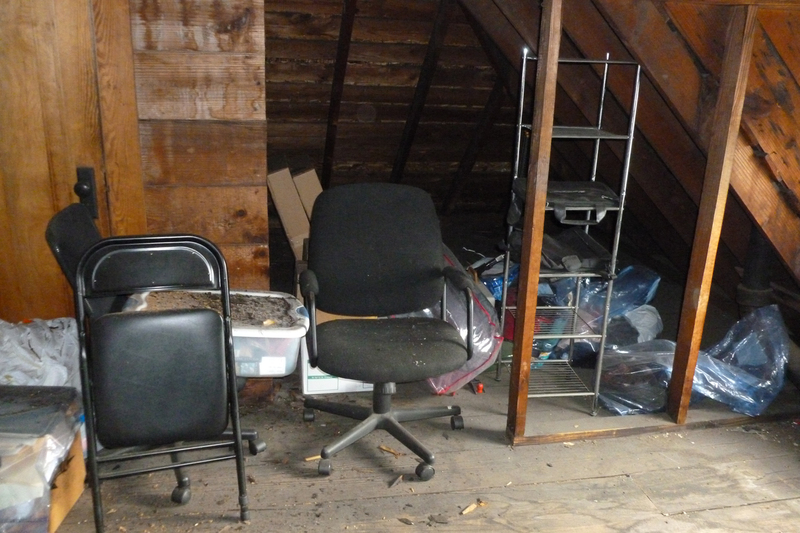 We do need to use the attic for storage, so some of our stuff is just sort of crammed up there right now. Our 2015 roofers collected all of the debris they tossed onto the lawn, but none of the debris that fell down into the attic itself. It’s shameful, but today it’s been 14 months to the day and we haven’t even started to sweep up. We also need to insulate the attic YES THE WHOLE THING and finish connecting the wiring so we can have some light up there. Then we have all of the finishing touches, including drywall and repairs to the remaining dormer. Long-term, we’d like to have an enclosed permanent storage space; skylights; a reading room; an enclosed mini theater; and a large craft space up there, along with a separate large room for Laulo to host D&D games. So here are our attic to-do lists: one for 2017 and one for the time between 2018 and, I dunno, 2025 or something. Basically whenever we can raise the funds. Mop and sand and mop and sand the damn floor since the dust from replacing the roof is part of the wood now. Seal the floor with enough layers of varnish that we never have to think about the goddamned attic floor ever again. Drywall the south- and east-facing sections. Install temporary shelving along the south- and wast-facing sections. 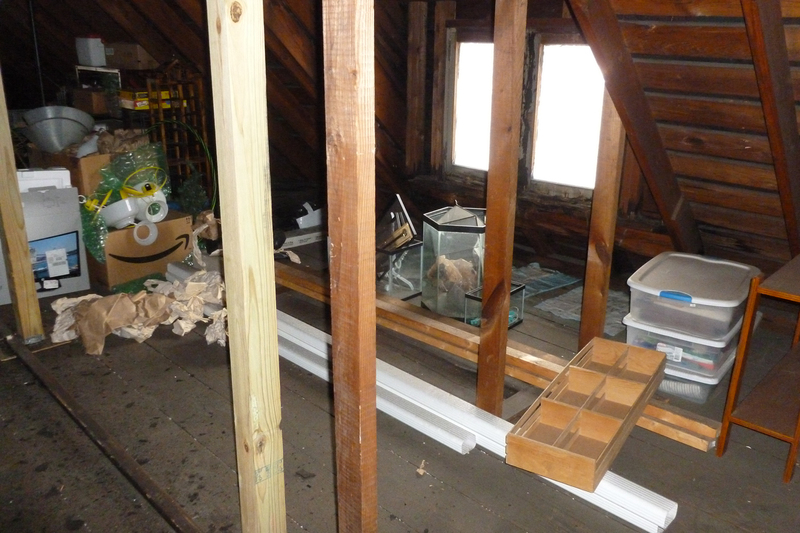 Sand, treat, and stain the built-in closet (it has water damage and a small amount of dry rot). Drywall the north- and west-facing sections. Before winter, put down several area rugs and/or thick Army style blankets in sections directly above the second-floor rooms that are in use (for a little additional insulation). Connect the existing attic wiring to the Craphome’s breaker box. Install permanent shelving in the southwest and northwest quadrants, from the built-in closet to the far west wall. Replace the remainder of the roof. 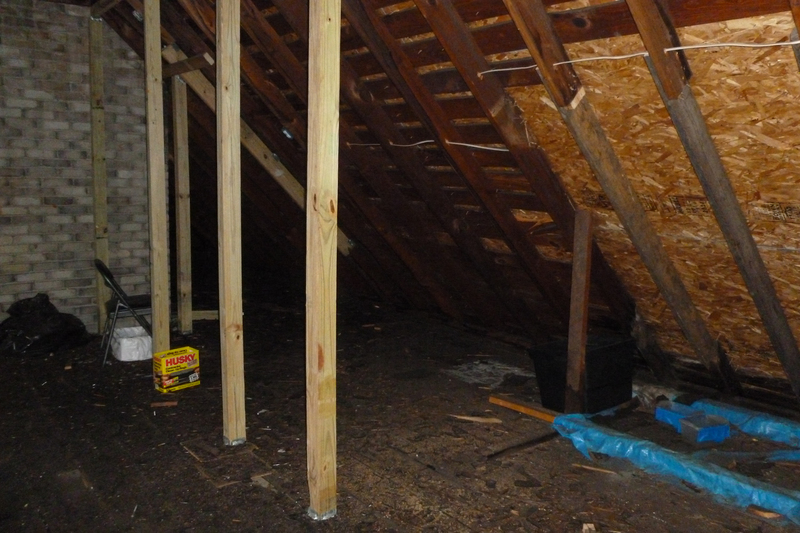 Install skylights in the flat portion of the roof or along the north and south sides. Build walls to create three rooms: one in the eastern section, one along the southern section from the chimney to the built-in closet, and one along the northern section (same length). Build walls to complete the permanent storage areas in the southwest and northwest quadrants. Create built-in seating and permanent shelves in the reading and craft rooms. Run plumbing for a small sink to the craft room and install the sink. Build a dedicated gaming space in the game room. Install seating, a decent flat-screen television, and a good stereo system in the media room. Install 5-10 solar panels along the south-facing side of the roof, with the goal of generating enough energy to at least run any appliances, lights, and small space heaters we install in the attic. The first step is to get all of the roofing debris out of the attic…after 14 months of slacking off there, we will tackle that this spring. 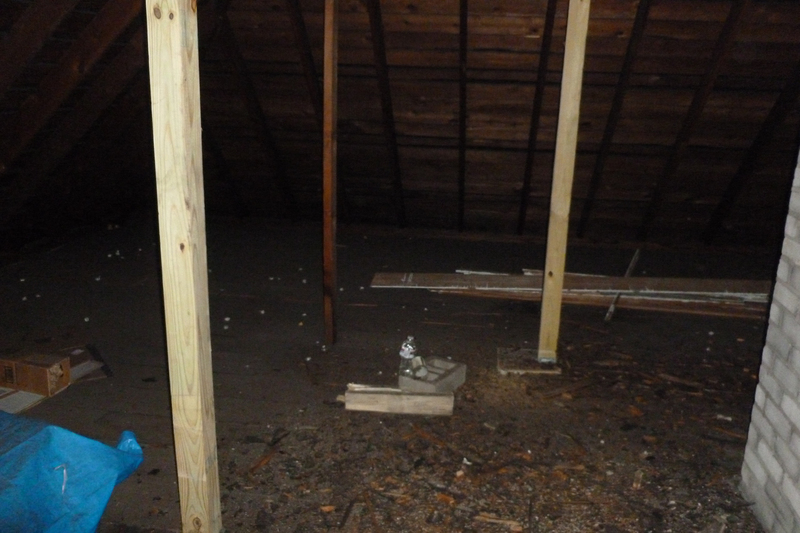 Here are some before photos to get us started. General storage and mess, west side. You can just see the edge of the built-in closet. General mess, south side. The tarp was there to catch leaks from the old window. General storage and mess, north side. General storage and mess, north side (facing west).